Water is amazing stuff, especially when you drink it. It doesn’t just refresh and cool it is also proven that regular intake of water throughout the day can improve concentration. That’s something school teachers and parents understandably get excited about. Principles Agency was asked by Yorkshire Water to devise a commercial that asked schools to come forward and claim a free watercooler and water bottles for their pupils. 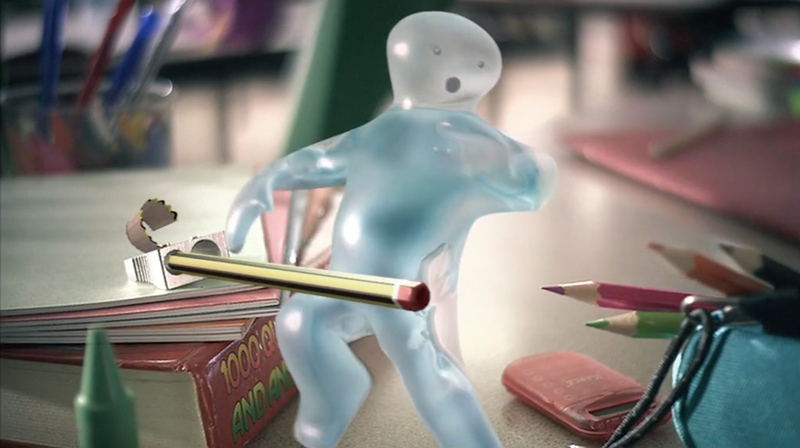 We created Walter, a diminuitive, friendly CGI character who tops himself up at school. Walter: Break time is it? Tell you what; it’s easy to get thirsty at school. Ow! All those lessons! And then there’s sports day! Drinking plenty of water is a good idea for kids. And like eating well, hydration helps keep ‘em healthy and refreshed. (Gasps) Running low. Watercooler ahoy! watercoolers to Yorkshire primary schools.